Perfume Flower Tree, Pua Keni Keni. Specimen tree or shrub. Can be a large shrub or pruned to a small tree. 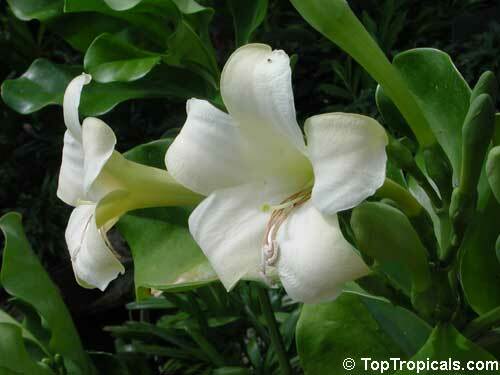 Amazingly fragrant 3" tubular shaped flowers of creamy white turn golden orange as the day longs. Flowers are popular for making Lei's. 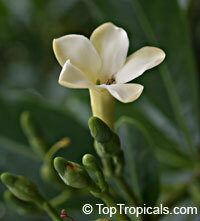 Pua Keni Keni in Hawaiian translation means "ten cent flower" which 6is what the flower once sold for. Barely cover the small seeds using well draining soil mixture. Keep warm, damp and in bright light. Requires high humidity. Perfume Flower Tree, Pua Keni Keni, - very fragrant flowers. Small tree or large shrub with large leathery leaves. F. Ceilanica is similar to Hawaiian Pua Keni Keni, but with bigger flowers. Perfume Flower Tree, Pua Keni Keni, Todopon Puok, Kopi hutan - very fragrant. The plant is similar to Hawaiian Pua Keni Keni, but with bigger flowers, and has a vining habit. 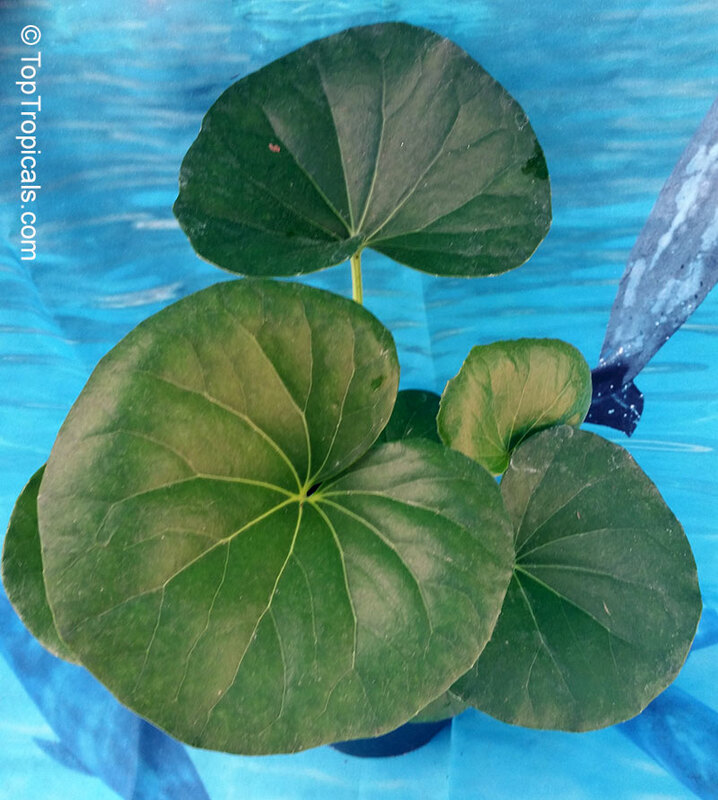 Leopard Plant. Origin: Japan. A perfect full shade plant! 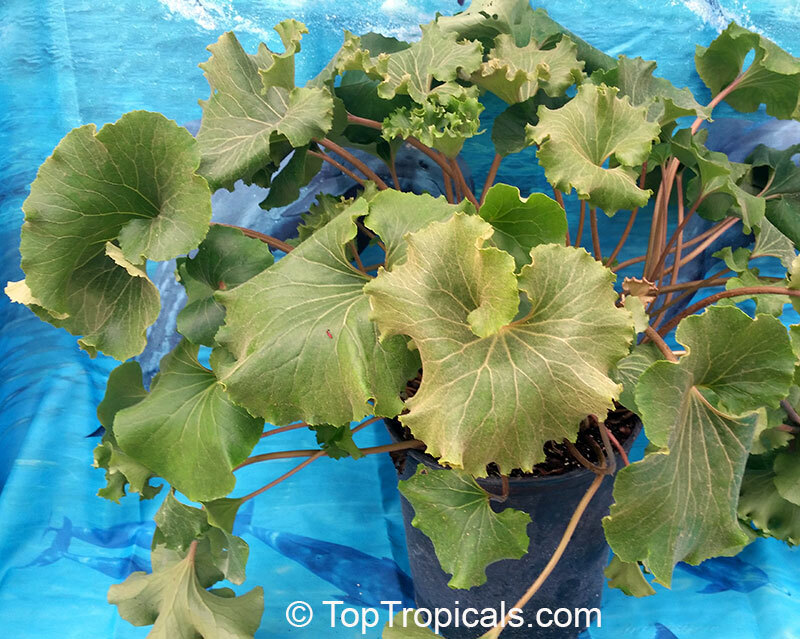 Farfugium japonicum grows in a loose clump about 2 ft tall and wide spreading by rhizomes. Daisy-like yellow flowers, 1-2 in across, are borne in loose clusters. 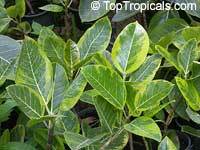 Some cultivars have shiny green leaves variegated with irregular creamy white or yellow markings. Leopard Plant. Origin: Japan. A perfect full shade plant! 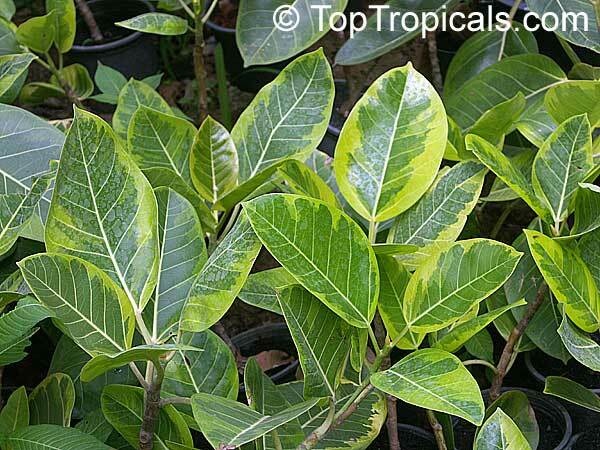 This evergreen foliage plant has large, leathery leaves and daisy-like yellow flowers. It looks great in the border or in containers. Matte, gray-green leaves form a glorious tangle of tight, crispy edges. 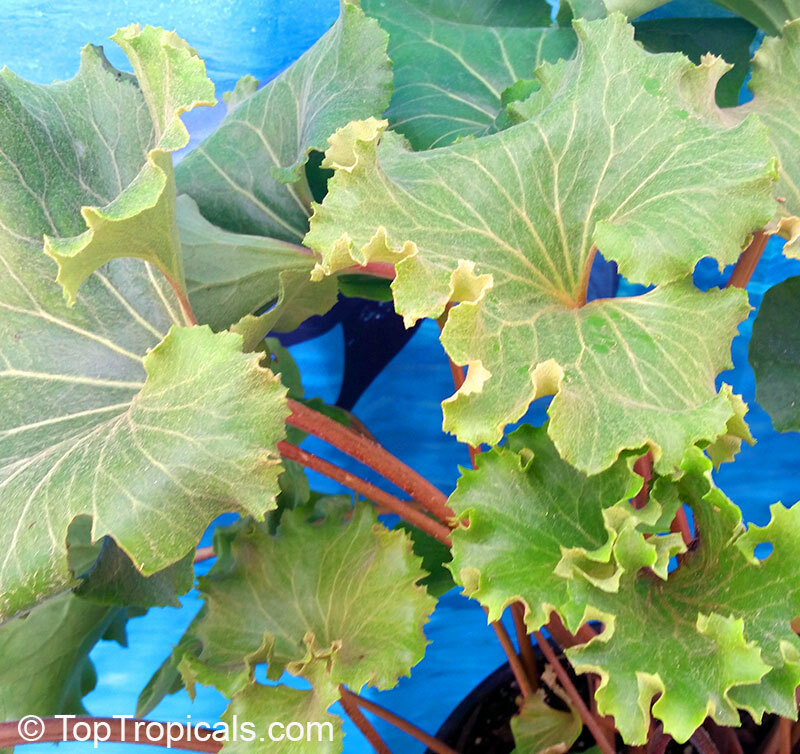 This plant does best in moist soil, and while it can take more sun than other varieties, it still needs shade from afternoon sun. Great indoor plant. Erect stems with huge palmate leaves splashed with creamy white variegation. Late winter produces 15-inch panicles of creamy white flowers followed by large, black berries that persist through the winter. Grows 6 to 8 feet tall and 4 to 5 feet wide. 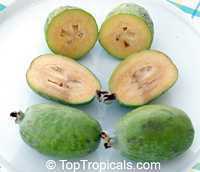 Feijoa, Pineapple Guava, Guavasteen. The fruit emits a strong long-lasting perfume, even before it is fully ripe. The fruit have the best taste when pulp mixed with sugar - it tastes and smells somewhat like forest strawberries. 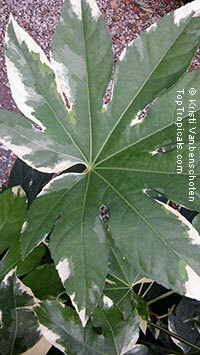 Cold-hardy, tolerates freze, nice wind-protection shield for other tropical plants. Feijoa, Pineapple Guava, Guavasteen. 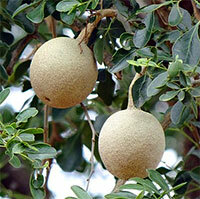 The fruit emits a strong long-lasting perfume, even before it is fully ripe. 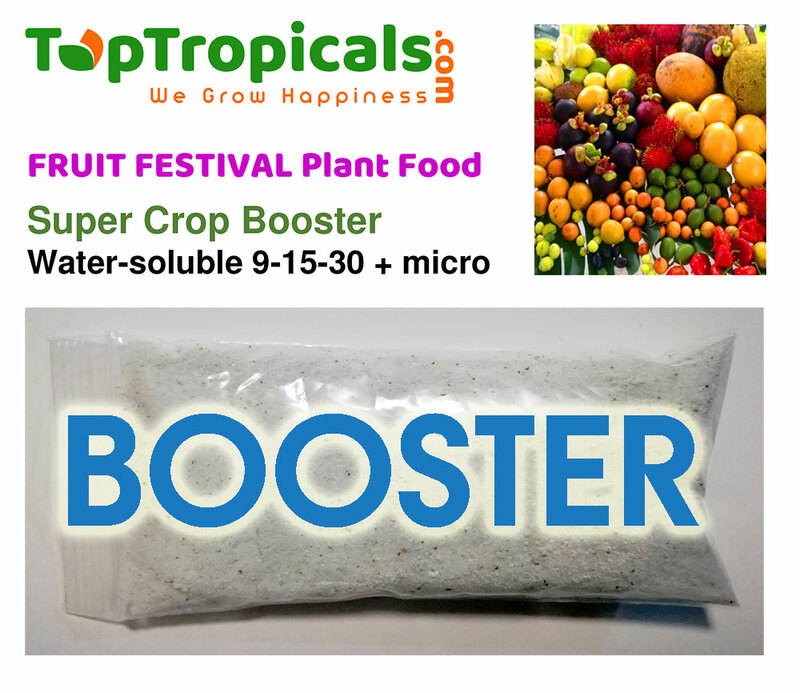 The thick, white, granular, watery flesh and the translucent central pulp enclosing the seeds are sweet or subacid, suggesting a combination of pineapple and guava or pineapple and strawberry, often with overtones of winter green or spearmint. Feijoas prefer cool winters and moderate summers (80 to 90 F), and are generally adapted to areas where temperatures stay above 15 F. The flavor of the fruit is much better in cool than in warm regions. Barely cover seeds with well-drained soil mix, keep warm, slightly moist and in filtered light. 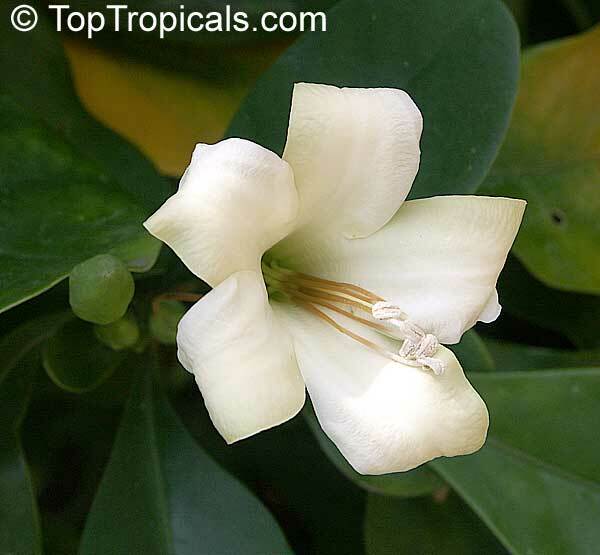 Red-leaved Medlar, related to Gardenias, this rare in cultivation African shrub has sweetly fragrant flowers. 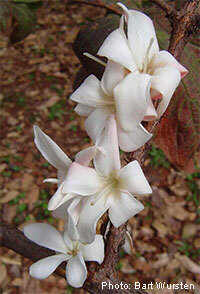 They are white, flushed with pink, solitary or in clusters, borne on the branches and stems. NEW INTRODUCTION: Fernandoa. Rare African tree, endangered species. Spectacular bloomer! Small, often multi-stemmed tree, great for small yards or as a collectable specimen. 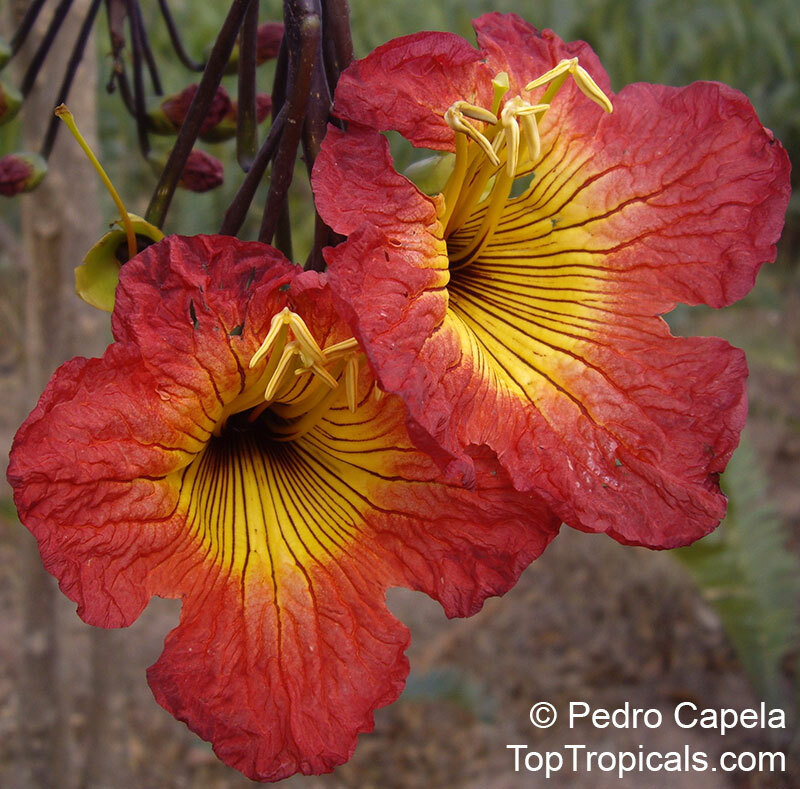 Flowers in clusters, spectacular, bright orange-red with a yellow center; corolla bell-shaped, up to 4" in diameter, shallowly lobed with 4 large stamens protruding. 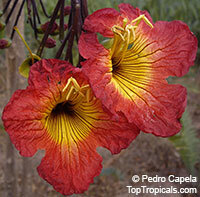 One of the most wanted flowering trees. 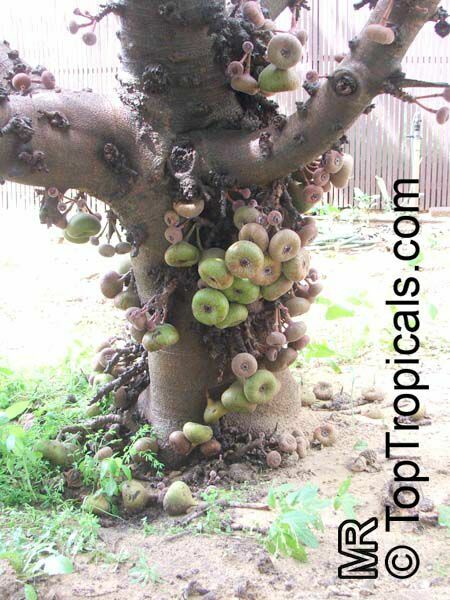 Elephant Apple, Bel Fruit. This slow growing tree from India can be grown in a pot as a small specimen or used as a bonsai. The fruit looks similar in appearance to fruit of Bael. The pulp can be eaten raw, but it is popularly scooped out and frozen, or made into jam. It can also be mixed with coconut milk for a delicious, health beverage, or frozen into ice cream. The vast array of health benefits that are attributed to wood apples are mainly due to their nutrients, vitamins, and organic compounds, including their tannins, calcium, phosphorous, fiber, protein, and iron. It is a commonly known herb in Indian system of medicine. Elephant ear fig tree, Giant Indian Fig. The elephant ear fig tree is the fig tree with the largest leaves in the rainforests of Xishuangbanna. This is surely an impressive fig species and it makes a great indoor plant for large rooms or hotel lobbies. It can also easy be trimmed and the plant reacts with even more shoots and leaves on a thicker stem. The fruits are very much liked for the jelly-like substance containeed in them. 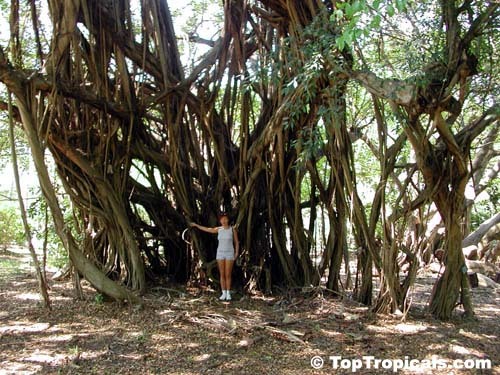 Banyan Tree. 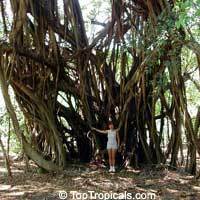 Fast growing, evergreen tree with spreading branches and many aerial roots. Great for bonsai. Benjamin Fig, Benjamin Tree. A tree or shrub that is epiphytic when it is young. 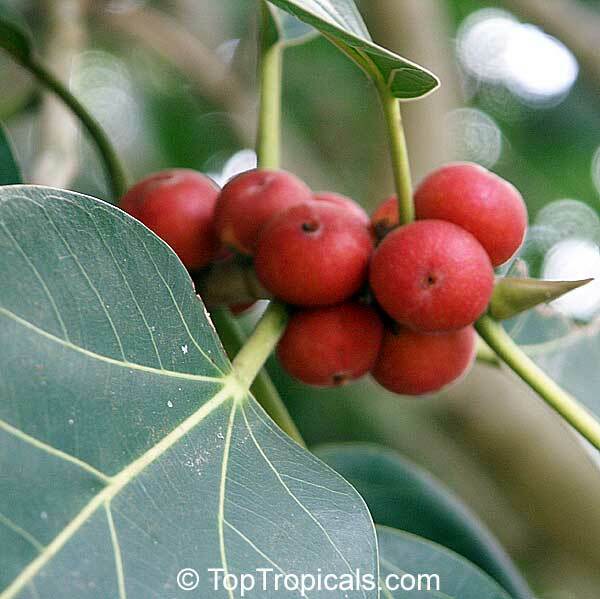 This fig tree is used as a shade and ornamental tree for homes and conservatory. The leaves and the fruit posses the ornamental value. The leaves are leathery and about five inches long and two inches wide. The Weeping Ficus fruits are pairs of red figs. Wasps mate inside fruit, are often sealed inside. Makes a good container specimen or bonsai. Beer's Black Figs are medium sized with outstanding flavor. A reddish pink interior and a violet skin. Beers Black cultivar is somewhat similar to Violet de Bordeaux in overall flavor, and to some people has even better characteristics. Rated to zone 7 and potentially to zone 6, so many homes can enjoy growing this cultivar outdoors year round. 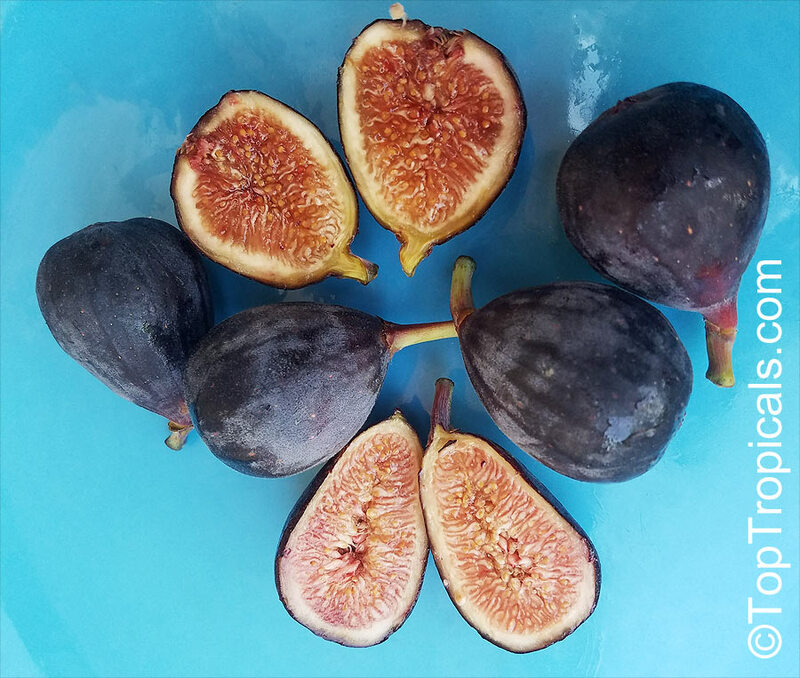 The health benefits of your homegrown figs are an added plus; they are high in Iron, Fiber, Potassium, and Calcium. 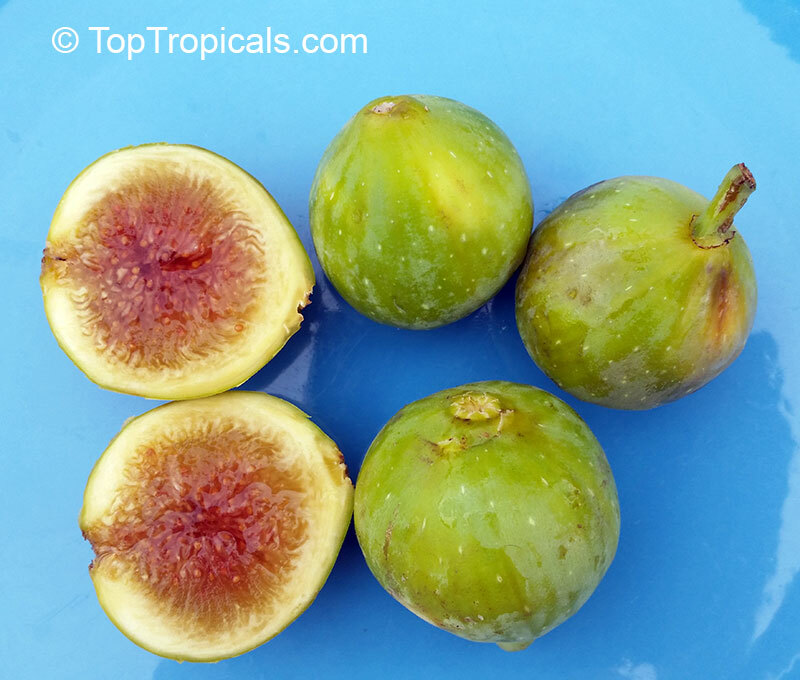 If you love delicious, healthy treats... Fresh figs are a natural choice! 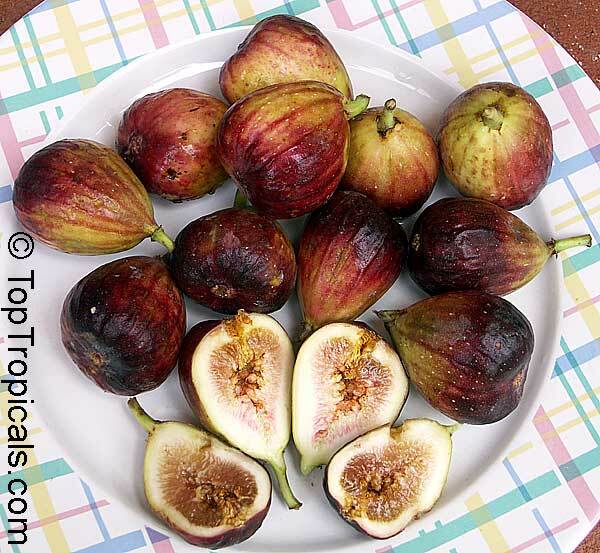 Figs are prized for their delicious fruit, which can be one to three inches in length, violet, brown or black. Most fruits are borne from early summer to late fall on new growth, and the fruits generally mature very quickly. The lovely lobed green leaves make it valuable in the landscape even without its fruit. They are very large, prominently veined and deeply lobed and may be 8 to 10 inches long. The fig makes a splendid patio or indoor plant that grows with little attention, save for constantly moist soil and bright light. 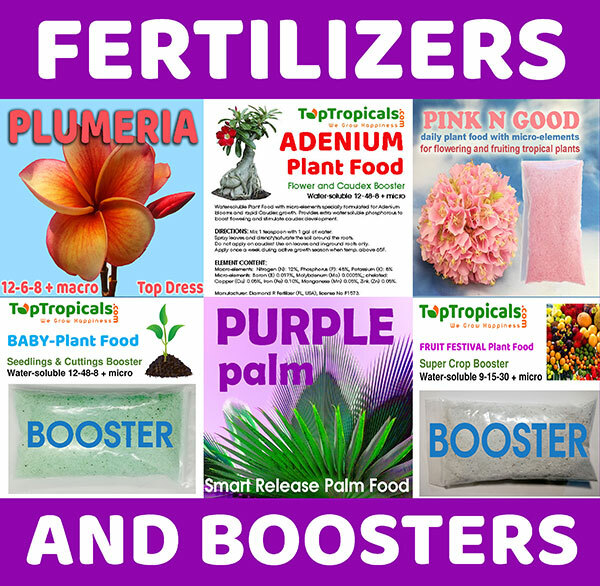 Prefers alkaline, well-drained soil, but can tolerate wet conditions. Trees are very sensitive to frost when actively growing, but can withstand 10F when dormant. 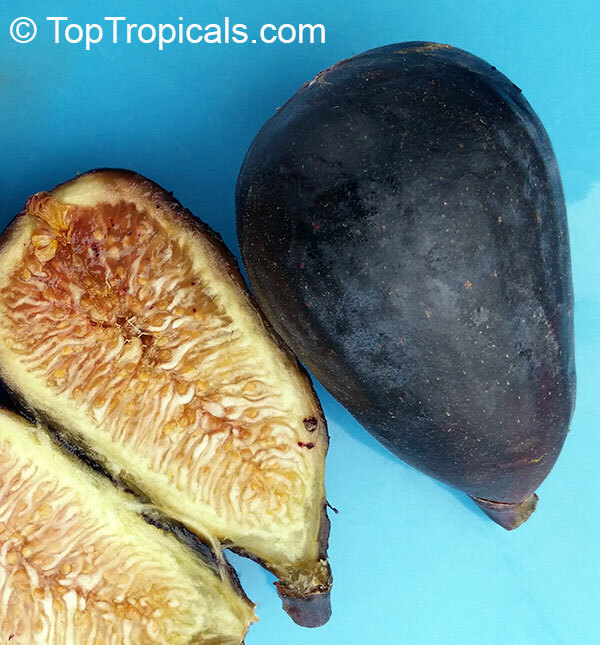 Fig Tree - dark fruit Black Mission variety. Introduced in California around 1770 from mission station in Baja. A hardy and easy to grow fruit tree, tolerates freeze. 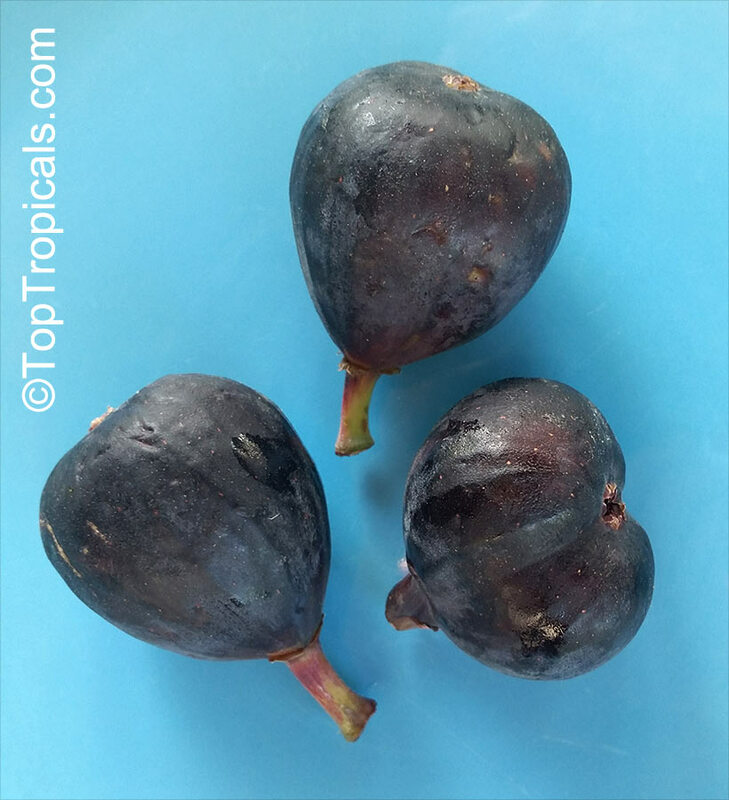 Black color fruit, with amber to strawberry color pulp. Sweet rich flavor, excellent fresh quality. 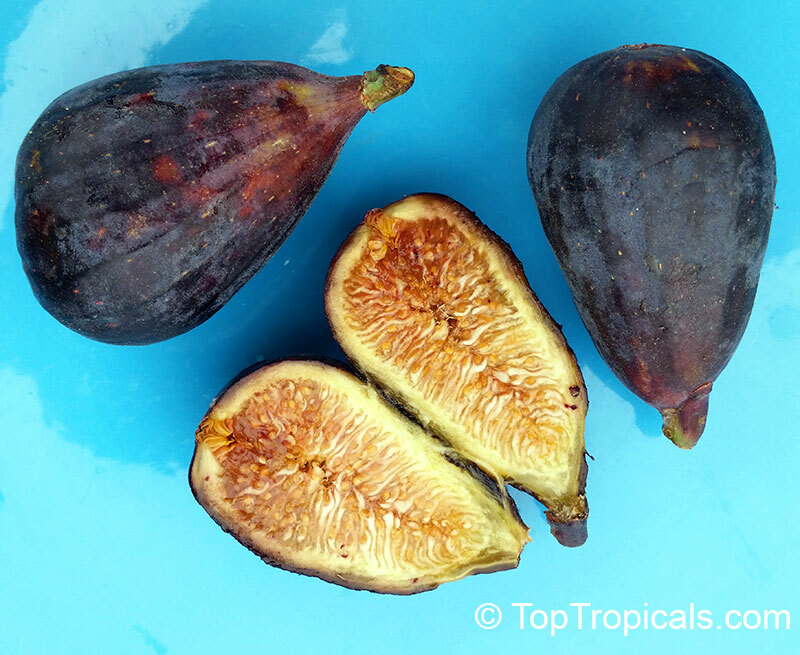 Unlike many other fig varieties first crop (breba crop) is good as well in most growing conditions. Fig Tree - dark fruit variety: Brown Turkey. A hardy and easy to grow fruit tree, tolerates freeze. 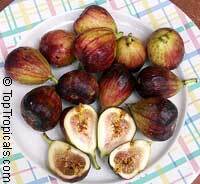 Figs are prized for their delicious fruit, which can be one to three inches in length, violet, brown or black. Most fruits are borne from early summer to late fall on new growth, and the fruits generally mature very quickly. The lovely lobed green leaves make it valuable in the landscape even without its fruit. They are very large, prominently veined and deeply lobed and may be 8 to 10 inches long. The fig makes a splendid patio or indoor plant that grows with little attention, save for constantly moist soil and bright light. 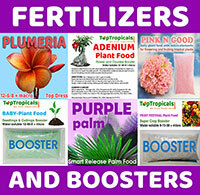 Prefers alkaline, well-drained soil, but can tolerate wet conditions (waterlogging). Trees are very sensitive to frost when actively growing, but can withstand 10F when dormant. 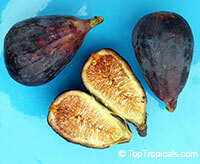 Celeste is a small, brown to purple fig well adapted to the South East and fairly cold hardy. The fruit ripens well before most figs. Celeste produces fruit good for eating fresh, processing, or preserves. They freeze well too. Fig Tree - light skinned variety: Ischia. Light skinned, with strawberry colored pulp, very sweet and rich. Ripens early. 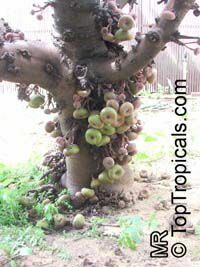 An easy to grow fruit tree, tolerates freeze. Figs are prized for their delicious fruit, which can be one to three inches in length. Most fruits are borne from early summer to late fall on new growth, and the fruits generally mature very quickly. The lovely lobed green leaves make it valuable in the landscape even without its fruit. They are very large, prominently veined and deeply lobed and may be 8 to 10 inches long. The fig makes a splendid patio or indoor plant that grows with little attention, save for constantly moist soil and bright light. 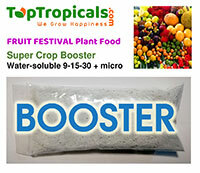 Prefers alkaline, well-drained soil, but can tolerate wet conditions (waterlogging). Trees are very sensitive to frost when actively growing, but can withstand 10F when dormant. Compact tree, very popular for pot culture. Fig Tree variety "Texas Everbearing" ("Southern Brown Turkey") - dark fruit variety. A hardy and easy to grow fruit tree, tolerates freeze. Fruit is very similar to Brown Turkey fig with excellent sweet flavor. It's known to bear few times a year in warm areas. A hardy and easy to grow fruit tree, tolerates freeze. Figs are prized for their delicious fruit, which can be one to three inches in length, violet, brown or black. The fig makes a splendid patio or indoor plant that grows with little attention, save for constantly moist soil and bright light. 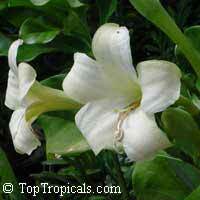 Prefers alkaline, well-drained soil, but can tolerate wet conditions (waterlogging). Also known as Negronne, Violet de Bordeaux is a purplish-black fruit with rich strawberry pulp. Considered by many the finest tasting fig. Popular in the Northwest and West. Needs protection in cold winter areas. Good for home planting as tree is dwarf. Similar fruit to Black Mission, but hardier and a smaller size tree than Mission. 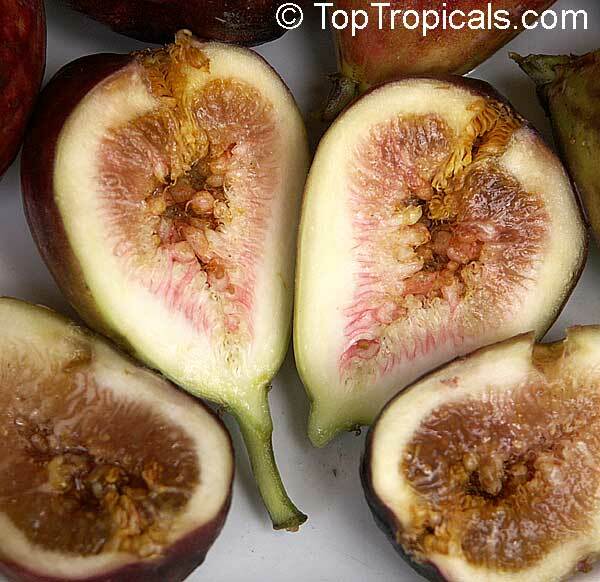 It is the best fig cultivar if you have a small growing space or wish to grow the tree in a container. Grown in U.S. Department of Agriculture plant hardiness zones 7 through 10, this small fig grows to only 6 to 10 feet tall and 6 feet wide. The late-ripening fruits feature purplish-black skin, strawberry flesh and a rich, sweet flavor. Trees are ready for harvest in early fall, but if mild climate away from coastal areas, you can expect to enjoy a harvest in midsummer and early fall.